The public procurement project "Smart Factories in new EU Member States" will contribute to the efforts to build a network of Digital Innovation Hubs (DIHs) in Europe, where companies - especially SMEs - can have access to expertise, development and testing facilities of digital technologies, as well as finance and innovation services. 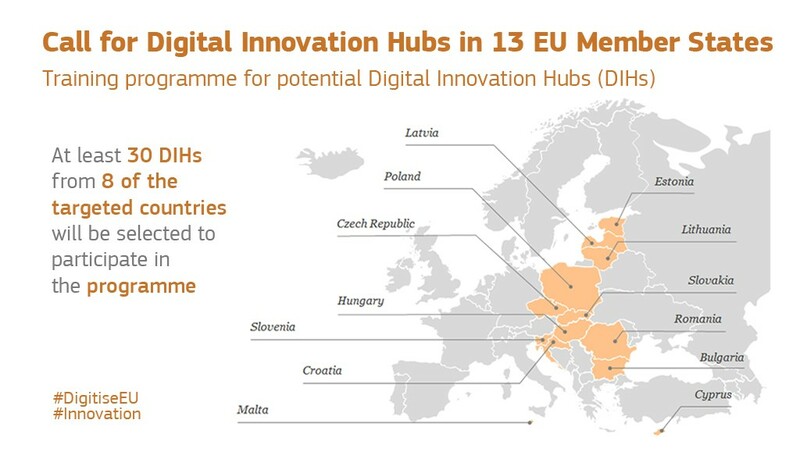 The European Commission has awarded this service contract to PwC - in cooperation with Oxford University Innovation (Oxentia) - in order to support the implementation of Digital Innovation Hubs across EU13 Member States. This initiative will therefore contribute to the digitisation of the industry in the selected countries and regions, where the divergence in uptake and adoption of digital technologies has been so far limited. Show the state of play and develop clear and targeted policy recommendations to uplift industrial production capacity. The project was launched in May 2017 with a financial scope of €1.8 million and it will run for 18 months. It will capitalise on achievements and lessons learned from previous and ongoing relevant initiatives such as ICT Innovation for Manufacturing SMEs (I4MS), which has already completed a mentoring programme for 29 new hubs. The European Commission is managing the project for the European Parliament, who launched it as a preparatory action with the aim to develop a coherent, coordinated and sustainable approach to enhance the engagement of all relevant stakeholders from EU13 Member States (industry, academia, research organisations and civil society) with regards to the activities of the European Commission and particularly of the Factories of the Future programme. It was initiated by Victor Negrescu (former MEP and current Minister Delegate for European Affairs in Romania). The 30 selected potential hubs will be offered a training programme that will include different types of activities such as the development of a specific business plan, training and coaching, provision of manuals and relevant documentation, establishment of potential funding schemes, as well as organisation of regional workshops. The training will be divided into thematic modules. Every training programme will include components applicable horizontally and more tailored components based on specific country factors and DIH advancement. The aim is to provide potential hubs with business development skills and help them with their business model definition and feasibility study. A call for interested participants was open until 7 November. The Evaluation Committee met in December 2017 and selected 34 potential hubs across all the EU13 Member States to take part in the programme. Training and mentoring activities will take place between February and November 2018. This will be based on training needs assessment and inputs from the key stakeholders in order to fully respond to DIH and market needs. The second task of the project is to deliver a study which will contain the final analysis of industrial competitive advantage of Eastern Europe regions and the potential for smart specialisation at regional level. The report will present conclusions and concrete policy recommendations at local, regional, national and EU level. These recommendations will focus on public policy on innovation and funding for further growing the network of DIH and improving industrial competitiveness in this area. Should you wish to know more about the project please contact us at: Smart.Factories@pl.pwc.com.